SINGAPORE - While there are more job openings than job seekers, the number of vacancies has shrunk. There were 116 openings for every 100 job seekers in September last year, down from 141 in September 2014. In all, there were 60,000 vacancies in September last year, down from 67,400 the year before. 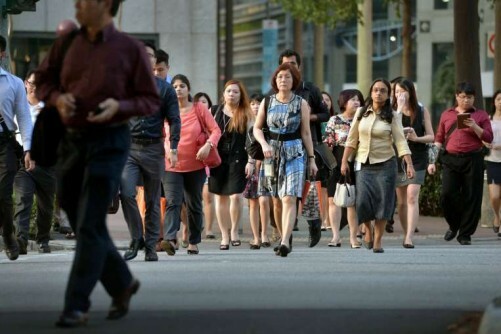 The decline in the number of vacancies was broad-based and brought about by softer economic conditions, said the Manpower Ministry (MOM) on Wednesday (Feb 3) in its latest release of job vacancy statistics. About four in 10 jobs were for professionals, managers, executives and technicians (PMETs) in jobs like teaching, commercial and marketing sales, and software development. Workers are also needed in the services sector - for jobs such as waiters, retail sales assistants and security guards - where there were 12,270 vacancies. In its report, the ministry acknowledged that there are "hard-to-fill" jobs such as cleaners and labourers which Singaporeans shun and there is high turnover. The MOM urged employers to make jobs more attractive to prospective workers so that vacancies can be filled faster. It added that job seekers will also have to make themselves more employable and adaptable.